It seems as though everyone is talking about weighted blankets but what are they and what do they do? Are they just a marketing ploy, or really as amazing as so many people claim? Simply speaking, they are blankets that are heavier than a standard blanket due to being filled with something such as beads, which has many health and wellness benefits, so is it worth the hype? Deep touch pressure is known to release serotonin which is the neurotransmitter that contributes to a happy mood. So having something that essentially feels like a hug can help release this chemical and aid with reducing anxiety and increasing the quality of your sleep. They are not usually intended to replace your current comforter as most of them are sized to fit just one person, to work best. It may seem as though it is a product that has come entirely out of the blue all of a sudden, but they have actually been popular, specifically for people with special needs or who are on the autism spectrum, for many years. Companies have brought the blankets into the mainstream and marketed them less as a medical device, as they were before, and more as a general sleep and wellness product. Imagine having a lovely hug for hours at a time, without the awkwardness that might come with that. Users report feeling safe and relaxed while using the blankets and for those suffering from overstimulation it is a great way to reset. For those with chronic pain or even restless leg syndrome, weighted blankets are able to alleviate some of the symptoms. On top of this, people with insomnia often manage a better night’s sleep. Not all weighted blankets are the same, so it’s essential that you get the one that is right for you. Experts recommend choosing a blanket that is around 10% of your body weight for the most effectiveness. Be sure to do your research on the feel of the blanket itself, and the fabric used on the outside, particularly if it is for someone with sensory processing issues. Fillings are another thing to consider as they can include beads, discs or a blend of these with cotton, and each will give a different experience. Ideally, you will want a blanket with a removable cover so that it can be washed and kept fresh. People who use weighted blankets tend to swear by them, with many saying that they have ‘changed their lives.’ As long as you buy the right one for you, you should feel the benefits and will likely never want to crawl out from under it! If you have anxiety, insomnia, high levels of stress, or sensory issues, then it looks like they could be worth forking out for after all. 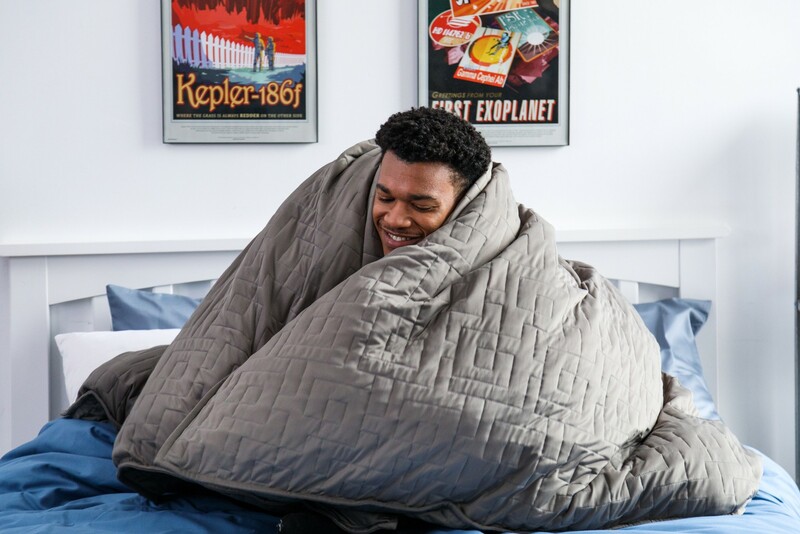 So, if you’ve been on the fence about buying a weighted blanket, or this is the first you’re properly hearing about them; hopefully, this has helped. We think they are totally worth the hype and so much more than just a blanket!